A direct-to-home television broadcasting satellite with a storied past finally rocketed into space today to become the newest star in the DirecTV constellation. Riding atop a Russian-built Proton rocket, the DirecTV-5 spacecraft was launched at 1700 GMT (1:00 p.m. EDT) from the Baikonur Cosmodrome in Kazakhstan. Six-and-a-half hours later, the 8,025-pound satellite was successfully delivered into a geosynchronous transfer orbit high above Earth, officials reported. 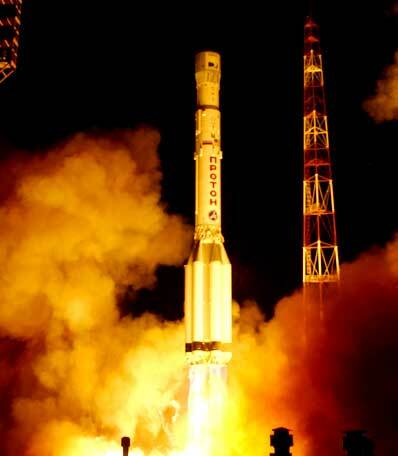 The mission was conducted by International Launch Services -- the joint U.S./Russian venture formed in 1995 to market the Proton and American Atlas rocket families. This satellite was manufactured by Space Systems/Loral several years ago to relay programming for the now-defunct direct-to-home TV broadcasting system called PrimeStar. 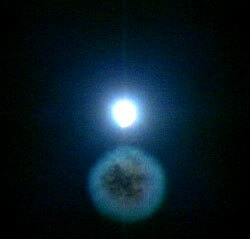 The craft's name was Tempo FM 1. In 1999, DirecTV bought out rival PrimeStar, taking its customers and assets, including this satellite. DirecTV dubbed the re-born spacecraft as DirecTV-5 and expected to launch it in late 2000. But those plans have been delayed repeatedly. The satellite was originally supposed to fly on an Atlas 2AS rocket from Cape Canaveral but was switched to a Proton by ILS last year because of the delays. Since the satellite had missed its spot in a full Atlas launch line-up, ILS was able to demonstrate its "mutual backup capability" by shifting the payload from one of its rockets to the other. "Due to modifications made on the satellite, it was not ready for its original launch date on Atlas," said ILS President Mark Albrecht. "We are committed to launching our customers' spacecraft when they are ready. So to accommodate this mission while keeping our commitments to other customers, we moved the DirecTV satellite to Proton." Although they can lift similar sized satellites into orbit, the Atlas and Proton are completely different rockets that are launched from different sides of the world. "The differences between the two vehicles give ILS a big advantage in the marketplace because if we should ever have problem with one vehicle it would not affect the other one," said Eric Laursen, ILS vice president and chief engineer. "This, plus the fact that the two vehicles have similar payload capabilities, similar reliability and similar launch rates, means we can back up one vehicle with the other." "This means we can move a customer's spacecraft from one launcher to the other, if necessary, and in so doing give our customer an extra measure of assurance they are going to launch on time and make their business plans," Laursen said. Rival European launch services provider Arianespace has backup between its Ariane 4 and 5 rockets. But the Ariane 4 is due to be retired after just four more flights. Once the Ariane 4 goes out of service in a matter of months, Arianespace will have just the Ariane 5 available to loft satellites into space. If the Arian 5 were to be grounded, like it was from July 2001 until this past February, the company would have no means of launching. That has prompted Arianespace to look at the new Japanese H-2A rocket for a possible backup arrangement in the future. However, this deal would only cover government payloads and not commercial satellites, an Arianespace spokeswoman said. The other two primary rocket fleets in the commercial market -- Boeing's Delta and the Sea Launch program -- already have a backup system developed. The change in rockets was supposed to allow DirecTV-5 to launch sooner rather than later. However, a problem with another Loral-built satellite already in orbit -- PanAmSat's PAS-7 -- forced more delays to ensure DirecTV-5 wouldn't suffer a similar power failure. 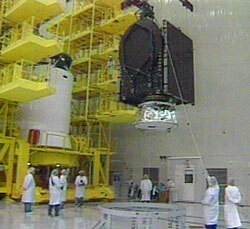 Finally ready to fly, DirecTV-5 was shipped to Baikonur and readied for launch on Monday, May 6. But Monday's countdown was thwarted in the final minutes by faulty ground support equipment that turned up during a pre-launch test of the Proton's guidance system. With the equipment replaced, Tuesday's countdown proceeded smoothly. Once DirecTV-5 is boosted into its final orbit 22,300 miles above the equator at 119 degrees West longitude and checked out over the next few weeks, the craft should be ready to enter service in July. DirecTV plans to use the new satellite to replace the older DirecTV-6 for providing Spanish-language and high definition programming to subscribers across the U.S. The DirecTV-6 satellite, which is actually the Tempo FM 2 spacecraft acquired in the PrimeStar acquisition, will become an on-orbit backup. 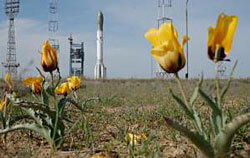 It was launched by an Atlas rocket in 1997. DirecTV-5 will also give the company more capacity, allowing new services and local TV channels to be added to the DirecTV line up. "DirecTV-5 will provide our satellite fleet with additional in-orbit redundancy and maximize the use of frequencies at the 119 orbital slot," said David Baylor, DirecTV's executive vice president. "The new satellite will increase our ability to enhance programming for existing customers, and on a limited basis, expand the number of markets where we will offer local channels." DirecTV is the leading satellite TV broadcaster in the U.S. with over 10.5 million subscribers. Once DirecTV-5 becomes operational, DirecTV will have seven satellites in orbit including four at its primary orbital slot at 101 degrees West longitude, one at 110 degrees West and two at 119 degrees West. The next ILS launch is expected next month when the Loral-built EchoStar 8 direct-to-home TV broadcasting satellite will be lofted for EchoStar's DISH Network. EchoStar is the No. 2 direct broadcast company, but is currently attempting to acquire DirecTV.